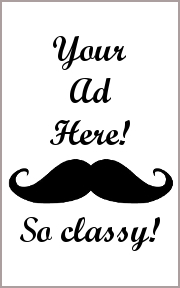 Time to end the feud between the Capulets and the Montagues once and for all! The feud between the Capulets and Montagues has now spilled into the streets and blood has been shed. While the feuding families are both powerful and influential, Prince Escalus cannot allow their civil conflict to disrupt the peace of his realm. He calls a council to end the feud once and for all, but there is a snag. The council is made up almost entirely of Capulets and Montagues! Instead of swords in the streets, the battle is now being fought across the council table with words and political intrigue. The new weapon is influence. Wield it wisely! Council of Verona, designed by Michael Eskue and published by Crash Games, is comprised of 17 Character cards, 20 Influence tokens (in 5 different colors, 4 tokens per player), 1 Council card, 1 Exile card, and 5 Character Influence Aid cards. The tokens are made of wood and solid. The Character cards are as thick and as durable as your standard playing card. The art by Darrell Louder and Adam P. McIver is excellent and strengthens the game’s theme. Not included with the game, but necessary to play if you are not playing the game’s Quick Play variant, is a pen or pencil and a piece of paper to keep track of players’ scores. To set up the game, first give each player 4 Influence tokens of the same color. Players should place their tokens face-down in front of them. Second, shuffle the Character cards to form a single deck. If playing with less than 5 players, remove the Character card with the “5” icon from play (the “Apothecary”, “Rosaline”, “Sampson”, and “Balthasar”). Based on the number of players, the next step is taken. For 3 or more players, deal 1 Character card to each player, face-down. Then, starting with the Dealer, each player selects a Character card from the deck, places it face-down, and passes the deck to the next player in turn order sequence. When a player is given the last 2 Character cards, they select the one they want to keep and place the other back in the game box without showing it to any other players. For a 2-player game, discard from play the first 3 Character cards without looking at them, then deal each player 5 Character cards face-down. The players then keep 3 of their 5 Character cards and pass the other 2 Character cards to their opponent. 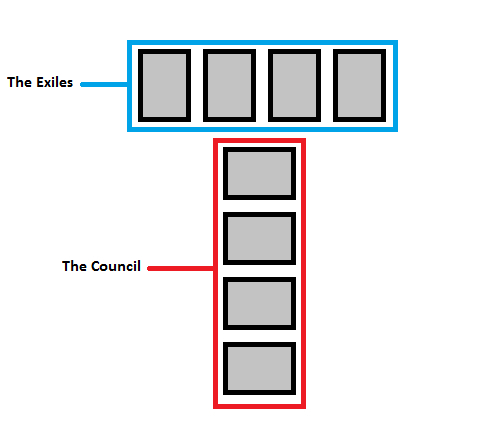 Third, and optionally, place the Exile and Council cards on the gaming table to they form a “T” shape. You can also pass out the Character Influence Aid cards if necessary. That’s it for game set up. Time to do some politicking. Council of Verona is thematically set in Shakespeare’s play “Romeo and Juliet“. 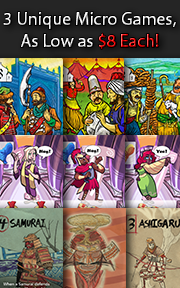 If you are familiar with the play, you’ll recognize the characters portrayed by the cards, but that does not provide any in-game advantage. If you are looking for games where being a Shakespearean scholar or enthusiast do give you an advantage, try Forsooth! There are 4 affiliations in the game. There are those loyal and affiliated with the Capulets (Juliet and Tybalt, for example), those affiliated with the Montagues (Romeo and Benvolio, for example), those who are neutral (Prince Escalus and Mercutio, for example), and finally those who are neutral but tend to also favor one of the two families (Nurse favors the Capulets and Friar Laurence favors the Montagues). Affiliation is very important when it comes to agendas and influencing the right Character card will ensure victory. But not all Character cards can be influenced. Some characters can be directly influenced by placing an Influence token on them. 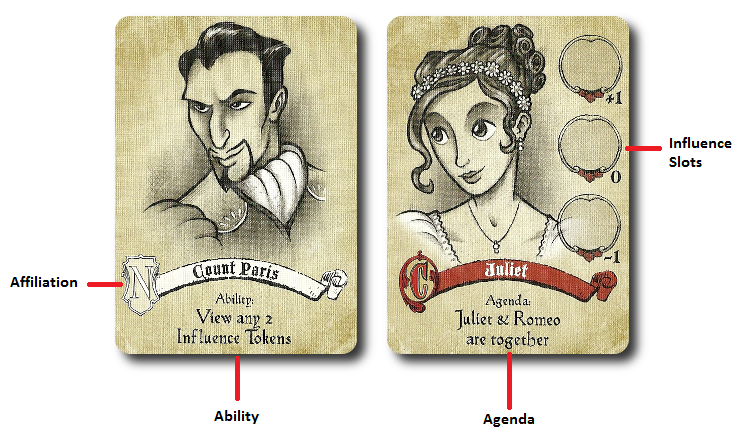 Influence slots are shown on these Character cards indicating where an Influence token is placed. Some of the Character cards cannot be influenced, but are no less useful. They add to the total number of Character cards of a certain affiliation or allow the player to manipulate the Character cards already in play. If a Character card has an agenda, players must help that Character card if they want a chance to influence it. Which is to say, the Character card with an agenda will only score points for the player if the agenda is successful! The agenda could be anything from having one affiliation owning the majority of Council seats at the end of the game or having specific individuals exiled. As the game progresses, players will be placing Character cards in hopes of helping or hindering an agenda. Along the way, the players will be influencing the Character cards that look to have the advantage. Council of Verona is played in rounds and turns. A typical player’s turn is summarized here and consists of 1 mandatory step and 2 optional steps. All steps should be played in sequential order. The player now looks their hand of Character cards and decides which one they want to play. Note that players MUST play a card on their turn, but where they play it is up to them. There are two different card groups in which a player can place a Character card. These groups include “The Exiles” and “The Council”. The two groups form a “T” on the gaming table. All cards are played face-up. Optionally, during game set up, you could place the Council and Exile card on the table to help remind players where to place cards. Note: When placing a Character card, it doesn’t matter on what end of the group’s row they are on, but make sure you read the Character card’s agenda. Once a Character card is placed, it’s very difficult to move it to another card group. The ability described on the Character card just played may now be activated. This is the only time the Character can can be activated for its ability. Note that not all Character cards have an ability, but every card in the game is exceedingly useful. There is no such thing as a “bad hand” or a “bad card” in this game. The player’s last step on their turn is to select 1 Influence token they have not yet played and place it down on any Character card in either of the two cards groups that has a free Influence slot. When placing the Influence token, it should be kept hidden from opponents at all times and placed face-down. Characters that can be influence have 3 available Influence slot. A player can influence a single Character more than once, but a Character card cannot be influenced more than 3 times. Before placing the Influence token, the player needs to consider a few things. Note: A player can look at the Influence tokens they have previously played at any time, but cannot remove them from Character cards. Some Character cards allow players to look at their opponents’ Influence tokens as an ability. This concludes the player’s turn. The next player in turn order sequence now goes starting with step 1 noted above. The endgame for the round is triggered when all the players have played their Character cards. Any remaining Influence tokens may now be placed in turn order sequence (placement is optional). The round ends and scoring now takes place. Each Character card is evaluated to determine if the described agenda condition has been met. If the agenda condition has been met, the Character card and Influence tokens remain. If the agenda condition HAS NOT been met, the Character card remains, but the Influence tokens on the Character card are removed from play. For those Character cards that remain and have met their agenda condition, the Influence tokens are revealed. Players now calculate the total Influence they have in both card groups by adding their Influence tokens, adjusting the total using the Influence slot modifiers. All the scores are recorded on a piece of paper and a new round now begins. After a number of rounds equal to the number of players in the game have been completed, the final score is calculated by adding all the points together. The player with the highest score wins the game! Play a single round of the game. The player with the most points at the end of the round is the winner. We often found that our players didn’t want to play the full game (too many rounds) and didn’t want to use the Pub Play variant (too few rounds). The number of rounds in the game is inconsequential. Play as many or as few as you like based on the time available and the tolerance of the players. Drafting cards at the beginning of each round is interesting, but ultimately unnecessary. You can make the game even faster by simply shuffling the Character cards, dealing them out, and discarding the correct number of cards before playing. Council of Verona did exceptionally well when it was on Kickstarter. So well, in fact, that Crash Games offered two alternative cards to be used in the game. 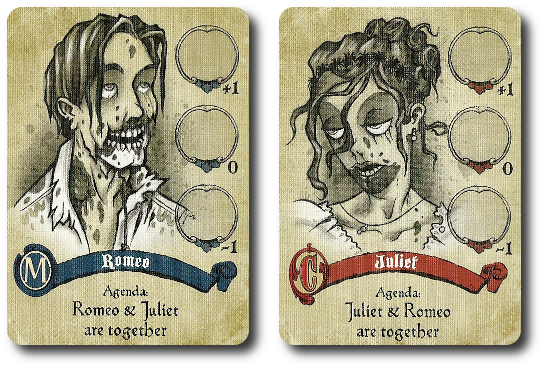 Specifically, “Zombie Romeo” and “Zombie Juliet” Character cards. If used, they replace the “living” cards of the same type and name. In the words of Patrick Nickell, the owner of Crash Games, “Alternative art of the star-crossed lovers, that proves their love persists even after undeath.” So much for “until death do us part”, eh? Note that these wickedly awesome cards DO NOT come with the game by default. They are add-ons and must be purchased separately. To learn more about Council of Verona, visit the game’s official web page. Council of Verona is a game that requires players to bluff and to deduce what is really going on at the table and in the heads of their opponents. This game isn’t so much a mystery as it is a double-blind shell game. There are lot of agendas to pursue and even more ways to trick opponents into thinking that some agendas are worth more than others. Games like this usually cause problems for younger players and non-gamers since the metagame here is pretty important. Don’t know what a metagame is? Yeah, that’s a new one for lots of people. Let me sum it up for you. Wikipedia does a pretty good job of describing it. Put another way, it’s the “game within the game”. It’s the layers in the cake. At it’s surface, the game is just about playing cards and tokens. Underneath its surface is a lot of bluffing, deduction, and critical thinking. Games like this enthrall Gamer Geeks. Metagames almost always have depth and require subtle tactics and strategy. I predict that the Gamer Geeks will very much enjoy Council of Verona as a result. The Parent Geeks will also enjoy the game, but it might take them a game or two to figure out that Council of Verona is more than what it first appears. The Child Geeks might be a bit disappointed at first, as I don’t believe they are going to “get” the metagame until after a number of game playing sessions. This might result in hurt feelings and a lot of frustration. Teaching Council of Verona is best done with a quick demonstration of a player’s turn and then describing how the round is scored. You can’t do much more than that and not much more should be required. The game play is very intuitive, after all. Note that the game does require its players to read. You cannot read for a younger player who is playing, as that gives the player who is helping an unfair advantage. Unfortunately, if the player cannot read, they cannot play. You could always team up, of course. I do this a great deal with my youngest little geeks and it’s a blast. 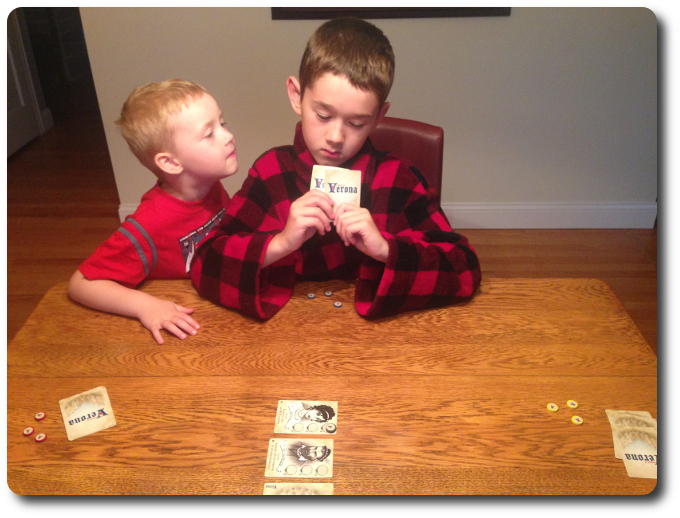 It’s a great way to teach and play a game with a Child Geek who cannot yet play, but wants to be at the gaming table. And so, after teaching Council of Verona to my oldest Child Geek, I asked him his thoughts on the game so far. The game he is referring to, which he believed was the same game, was Where Art Thou Romeo? This title is also from Crash Game and uses the same character illustrations, but is an entirely different game. Let’s play Council of Verona and see if it gets our vote or is exiled. The Child Geeks did HORRIBLE the first time they played Council of Verona. All the Child Geeks clearly understood how to play the game (Council of Verona is a very easy game to teach and to learn), but completely disregarded the fact that they had to attempt to figure out what Influence tokens were on the Character cards and what agendas their opponents were working on. This resulted in the Child Geek doing nothing more than playing cards, placing an Influence token (even if they didn’t need to) and very obviously working on just 1 agenda. When the first game was over, the final score for the Child Geeks was exceedingly low. This really frustrated some of the Child Geeks, but not one of the Child Geeks wanted to stop playing. The Child Geeks played again, and again, and again. Each game showed improvement until it became very hard to read the Poker faces of the Child Geeks. Consequently, their points also improved and they started winning games. According to one Child Geek, “This is a great game!” Another Child Geek said, “You really have to watch the other players and trust no one.” All the Child Geeks voted to approve Council of Verona with one exception. One Child Geeks was put out that they couldn’t play as Romeo and Juliet in the game. The Parent Geeks immediately understood how to play the game, but it took a full game for them to understand the subtleness of the game. Once they figured out how much deduction, bluffing, and obvious duping was going on (and needed), they really enjoyed themselves. Much table talk was introduced and it was obvious that some of the Parent Geeks were doing all they could to throw other players off. Which was really awesome. According to one Parent Geek, “I really like games like this. They are easy to play and they pack so much fun!” Another Parent Geek said, “As a non-gamer, I had no idea games like this existed. Is this a gateway game?” Hmm… One could call Council of Verona that, I suppose, but the point to make here is that this game got a non-gamer excited about the hobby. When all the games were over and the votes counted, the Parent Geeks voted to approve Council of Verona. The Gamer Geeks were eager to give this game a try since I talked it up a bit. When I introduced the game and we started to play, the Gamer Geeks immediately started commenting. One Gamer Geek said, ‘Oh, I see. Lots of agendas to work on. Cool.” Another Game Geek said, “Interesting, you have to think, think again, and think yet again on each of your turns.” The Gamer Geeks liked the level of thought they had to put into each play, the deduction element, the obvious bluffing aspects, and the game’s smooth game play. One Gamer Geek said, “The game feels a bit tense at first as you attempt to figure out what the hell everyone is doing. Then it gets crazy intense when you reveal the Influence tokens!” All the Gamer Geeks found Council of Verona to be a very tight and slick game, perfect for fillers, before bigger games, and as a light play after a larger game. In short, Council of Verona was warmly welcomed at the Gamer Geek’s elitist table. I really enjoy Council of Verona. There’s a lot going on in the game that you won’t see until AFTER you have finished your first round. To begin with, a savvy player will immediately recognize that there is a fair amount of bluffing going on. This is the best way to dupe opponents into placing Influence tokens on Character cards that you can later remove from the game. Table talk is a must here and enhances the game play experience. Second, the Influence token values are hidden, but not the fact that players are attempting to influence the Character card. This tells the other players a lot, as it suggests that the Character card in question is going to be a winner (maybe) when the round ends. Influence token values are “0”, “3”, “4”, and “5”, all of which are hidden until the end of the round. Players can place a “5” or a “0” on a Character card depending on if they want points or want to confuse an opponent. Third, the three Influence slots award the player a bonus, nothing, or a penalty. You’d think that a player who knows that the Character card is going to be a winner would place their Influence token on the +1 slot, but that is not necessarily correct. For example, I might not want my opponents to think too much about the Character card I just placed, so I might not place an Influence token on it at all. This leaves the +1 space open which could be a trap! Of course, I could place the “0” value Influence token on the +1 slot in hopes of drawing attention to the Character card, leaving me room to work on other agendas in secret! Finally, the Character card abilities are slight, but powerful. Timing is very important in this game and you need to determine when is the best time to play Character cards to the table. Once you do, you get a chance to use that ability, which might or might not have much of an impact depending on when it was played. Moreover, the card will have an impact to one or more Character card agendas! Hand management, resource management, bluffing, deduction, logical thinking, critical thinking, strategy, and tactics can all be found in this game. And it can be enjoyed in less than 15 minutes or for much longer. Is it any wonder why all our player enjoyed it, including myself? 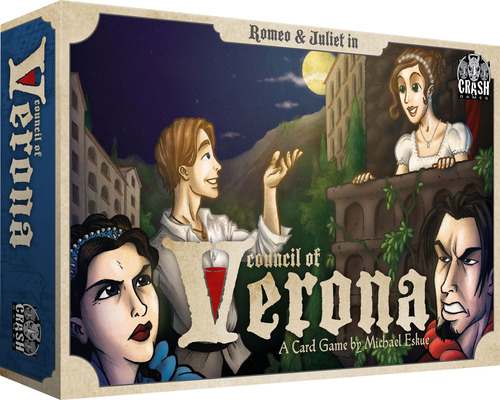 Council of Verona packs a lot into a little box and not once felt heavy or awkward. Game play was smooth with just a bit of tension rolling below the surface. Revealing the Influence tokens was like unwrapping a package that might or might not contain something you really wanted. Watching the Character cards come out always made our players stop, look at it, sit back, and then look hard at their own cards, while keeping a careful watch on their opponents’ faces. If you are looking for a small game that sets up fast, can be taught in a minutes, and enjoyed for hours, do take a look at Council of Verona. And if you want to make the game even better, include Council of Verona: The Poison Expansion. Tagged Bluffing Games, Card Games, Child Geek Approved, Deduction Games, Father Geek Approved, Gamer Geek Approved, Novel-Based Games, Parent Geek Approved, Renaissance Games. Bookmark the permalink.